The health benefits of honey and ginger for treating respiratory problems are unmatched by any other concoction. They help improve blood circulation, strengthen immunity, and treat respiratory problems and cancer. Furthermore, honey is an excellent medium for transmitting the benefits of ginger to the body. Both honey and ginger have their own individual health benefits and the combination of the two provides additional bonuses. It is believed that a mixture of honey and ginger, along with black pepper, is capable of treating or reducing the effects of asthma. It is a naturally soothing and anti-inflammatory mix, which releases tension, promotes the flow of oxygen to the lungs, and helps in the relaxation of the blood vessels. The mixture of honey and ginger is an excellent expectorant and, therefore, provides instant relief to people suffering from cough, cold, sore throat, and a runny nose. According to a study led by Max E. Levine, et al. high protein meals with ginger helped relieve delayed nausea associated with cancer. Patients often suffer from debilitating nausea following these intense procedures, and they turn to alternative solutions to eliminate it. Ginger speeds up the emptying of the stomach through its digestive properties, which can prevent the discomfort and probability of nausea. Nausea from chemotherapy is caused by cisplatin, a primary chemotherapy component, and ginger can balance this out with its powerful effects. A study by Vutyavanich T, et al. showed that ginger helps reduce nausea and vomiting that is associated with pregnancy and “morning sickness”. combined with the naturally soothing effects of honey, make for a powerful preventative solution against vomiting and nausea caused by various sources. A review article by Tahereh Farkhondeh, et al. studies states that constituents of honey exert antioxidant, anticancer anti-inflammatory, anti-microbial properties. However, more clinical evidence is required to support the benefit especially pertaining to anticancer effects. Ginger on the other hand is known to have many medicinal benefits because of its antioxidant effect ( Aeschbach et al. 1994; Ahmad, Katiyar, and Mukhtar 2001). A 2015 study by Miho Akimoto, et al. suggests that ginger has potential to act as anticancer agent against pancreatic cells. However, more clinical trials are required to establish the benefit. Further, article on role of ginger in treatment and prevention of cancer by Sahdeo Prasad (The University of Texas MD Anderson Cancer Center), et al. suggests that use of ginger is effective against gastrointestinal cancers such as gastric cancer, liver cancer, and pancreatic cancer. However more human studies are required for further evidence. In terms of cancer prevention, study by Hakim L, et al. suggests that combined treatment of gelam honey and ginger may help in enhancing the chemotherapeutic effects of 5-fluorouracil against colorectal cancer. Therefore, a honey ginger tonic can not only help to reduce the symptoms of chemotherapy but also to reduce the risk of cancer. It is believed that ginger and honey tonic or syrup is a good digestive aid due to the inherent digestive properties of ginger. Furthermore, both of them have antioxidant properties, thereby, improving the body’s immunity. Therefore, the consumption of one teaspoon of ginger and honey tonic is very useful for people who have a weak digestive system. Ginger honey tonic has high levels of protein, which aids in the digestive process, and it also stimulates the secretion of bile, which helps dissolve fat. Furthermore, it stimulates the growth of intestinal flora, which speeds up the digestive process and facilitates proper bowel movements. Lastly, this gives honey ginger tonic the ability to increase the absorption of other nutrients from food. This mixture has been traditionally given to children to ease stomach irritation because it is a very soothing solution. The antioxidant properties of honey and ginger tonic have been shown to moderate prostaglandin behavior in the body. Prostaglandins are lipid compounds that are derived enzymatically from fatty acids, present in ginger. These prostaglandins are found throughout the body and are functional elements in almost all organ systems. In terms of heart health, the moderating effects of honey and ginger tonic have shown a propensity to ease blood vessel tension, thereby reducing blood pressure and the chances of conditions like atherosclerosis, heart attacks, and strokes. People all around the world, especially in India, always keep both ginger and honey in their houses and prepare this beneficial mixture for someone falling ill with cold or a cough. 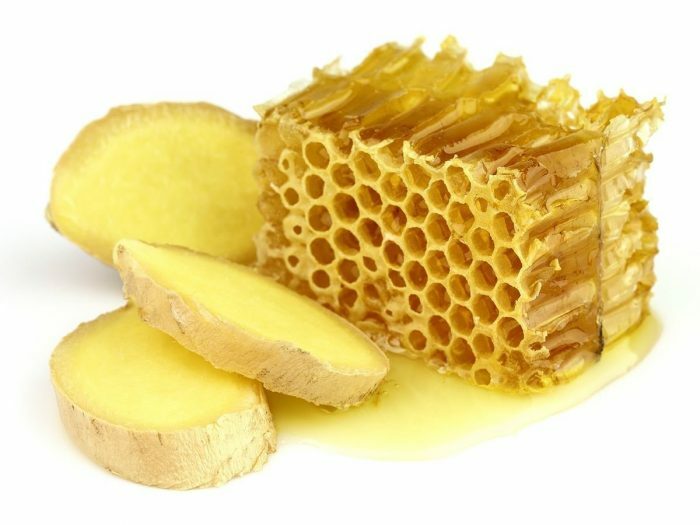 How to consume Honey & Ginger? The best way to consume ginger and honey is to mix one teaspoon of ginger root juice with one teaspoon of honey. Ginger honey crystals can also be purchased at markets and grocery stores. The crystallized ginger and honey that is pre-made retains most of the health benefits present in a fresh preparation and is meant for a quick and easy preparation of a ginger and honey beverage. Ginger honey candies are also very popular. If your throat is congested and you are not able to speak properly, you should eat candied ginger and honey as it normally clears the throat immediately. Ginger honey candies are also useful during traveling because they are known to help in dealing with motion sickness. Honey can be added to ginger to improve its taste. Honey acts as a sweetener, which makes ginger more palatable. Furthermore, it can be added to gingerbread, ginger cookies, ginger ale, ginger beer, carrot ginger soup, ginger punch, ginger biscuits, ginger snaps, ginger cake, and various other ginger recipes to enhance their taste. Honey is often added to ginger root tea, or ginger and cinnamon tea. You can replace sugar (if you are a sugar user) with honey while preparing the ginger tea, thereby giving your ginger tea an extra boost. Average rating 4.0 out of 5.0 based on 975 user(s).